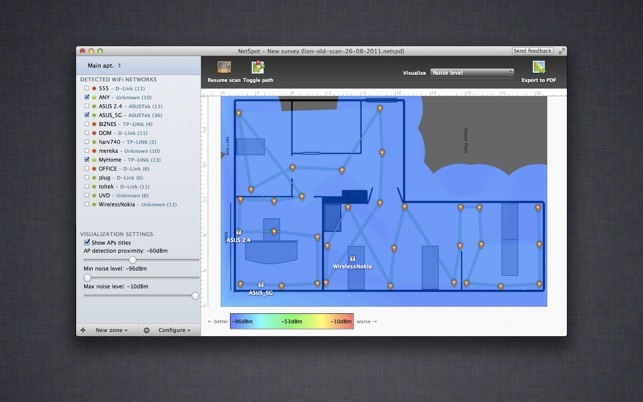 NetSpot goes far beyond usual WiFi scanning and analysis. NetSpot is the one and only full-featured WiFi site survey software and WiFi scanner on the Mac App Store. 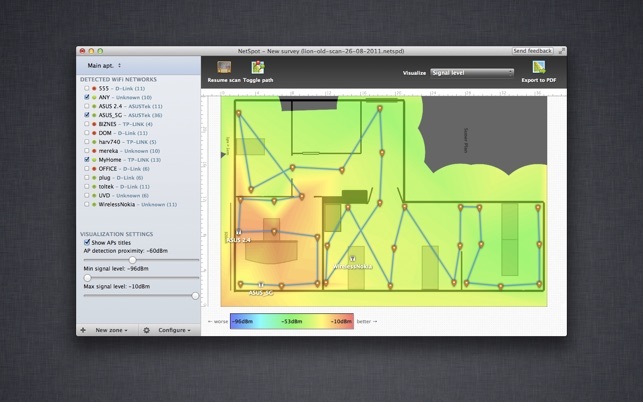 NetSpot is also an award-winning WiFi signal mapper and wireless manager. Exceptional simplicity and affordability make NetSpot the all-in-one WiFi networks detector and analyzer. 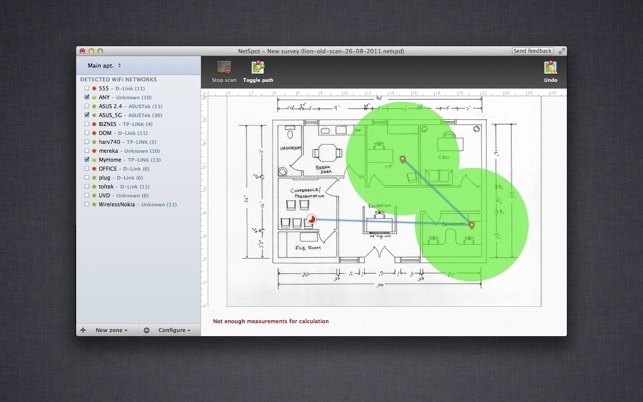 All you need to run your wireless site survey is your MacBook with native WiFi/AirPort adapter. No special knowledge or hardware required. 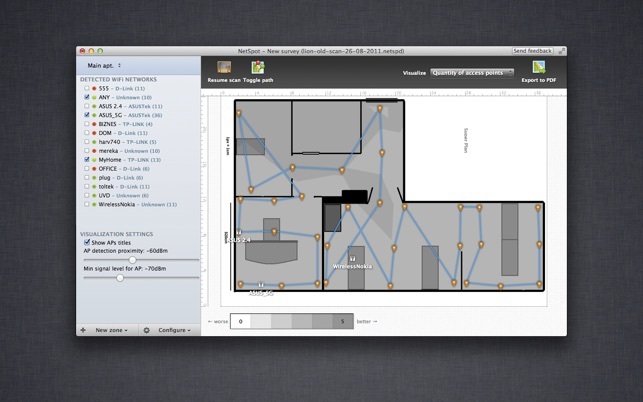 NetSpot helps anyone conduct a professional WiFi survey of a house, office, cafe, airport, building, or any other area. in general I was very pleased with the product and I think it could have a 4-5 rating. Easily… but (!) the last update is from 10 July 2015 - and maybe I am using it completely wrong… but the last three times I used the scanner (and also the reporter) the SNR map was always drawn at 0db… which is definitley not the case (I am also using another tool for comparison) … so all in all together at this very moment I would say: hardly 3 stars… but because the tool worked very well in the past and to take this into account - a 3 stars rating. Maybe this tool is discontinued… then please make a statement. If someone asks me today if I recommend buying this tool… I’d like to say rather not… also the device manufacturers list is really outdated. So wait until there’s an update to show this app is still under active development. I just love this tool. 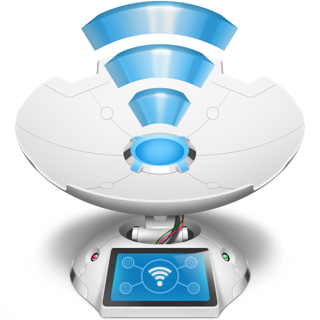 I already had problems with my wifi at home, however this tool enables me to see the waves of my wifi and shows the most efficient postion. I will be purchasing the pro version soon. This app is buggy for over about 3 years now, espacially signal-to-noise-ratio is not working at all. The homepage is outdated and show old video instructions (like there was a discover-mode in an early version of the app). The last update of the app was about 3 years ago. Seems to be discontinued.